From playing, to coaching, to being an influential leader in the NBA and internationally, Jerry Colangelo’s career is a story of remarkable success. The most recent chapter of his contributions is pure gold. Re-elected on Nov. 13, 2012, chairman of USA Basketball’s Board of Directors for the 2013-2016 quadrennium, his first involvement with USA Basketball began on April 27, 2005, when he was announced as the Managing Director of the then newly organized USA Basketball Men’s Senior National Team program. Taking control in 2005 of the USA National Team Program that hadn’t won a major international competition since 2000, Colangelo confidently rebuilt the program from the bottom up. Obtaining the involvement of the NBA’s top players, and securing the involvement of some of basketball’s most respected coaches, Colangelo’s first step in his rebuilding process was naming Duke University’s Hall of Fame mentor Mike Krzyzewski as the USA National Team head coach. Since Colangelo took charge of the national team, the USA men have compiled a remarkable 52-1 win-loss record in its six official FIBA or FIBA Americas competitions and have claimed gold medal finishes at the 2014 FIBA Basketball World Cup, 2012 London Olympics, 2010 FIBA World Championship, 2008 Beijing Olympics and 2007 FIBA Americas Championship. Overall, including official competitions and exhibition games, USA Basketball national teams with Colangelo at the helm are 75-1 for a spectacular .987 winning percentage. Undertaking his third quadrennium as the National Team managing director, the most recent chapter in the USA National Team’s success came in Spain at the 2014 FIBA World Cup. The USA rolled through the competition to finish 9-0 and successfully defend the world title. The back-to-back World Cup titles make the first time a USA team has won consecutive world gold medals. Returning in 2009 for a second run as the national team’s managing director, he got the program off to a golden start as the USA finished 9-0 to win the 2010 FIBA World Championship in Turkey. It was the USA’s first World Championship gold medal finish since 1994. Two years later, the U.S. rolled to a perfect 8-0 record to capture Olympic gold in 2012 in London and conclude his second quadrennium. During his first term as managing director, the 2006-08 USA National Team program compiled a striking 36-1 overall win-loss record, and just as importantly reestablished the USA team as positive ambassadors for the United States and the sport. The USA culminated the 2005-2008 quadrennium by finishing 8-0 to reclaim the gold medal at the 2008 Beijing Olympics. It was the USA’s first gold in a major international competition since 2000. The USA National Team also won the 2007 FIBA Americas Championship with a 10-0 record to qualify the U.S. for the 2008 Olympic Games. In the program’s first year, the U.S. captured the bronze medal with an 8-1 record at the 2006 FIBA World Championship in Japan. Colangelo was the face of the NBA Phoenix Suns franchise since their inaugural season in 1968 through 2012. While with the Suns, his roles included general manager, head coach, president, managing general partner, chief executive officer and chairman. His 43-year tenure with Phoenix came to an end in 2012 and was at the time the longest in the NBA. On two occasions Colangelo stepped in to coach the Suns, including the 1969-70 season when he guided the club to a 24-20 mark down the stretch and to its first playoff appearance. He also took over in 1972-73 and compiled a 35-40 mark. Overall, Colangelo is 59-60 as an NBA coach. His impact on the game of basketball has been so significant he was elected to the Naismith Memorial Basketball Hall of Fame in April 2004. On Nov. 4, 2007, Colangelo became the 12th member of the Phoenix Suns’ Ring of Fame, the club’s most elite group. 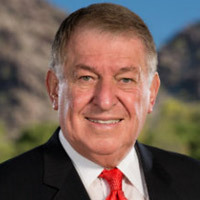 The Arizona Republic/azcentral.com in February 2012 selected Colangelo as one of Phoenix’s 15 all-time most influential citizens. The Arizona Republic also named him the Most Influential Sports Figure in Arizona for the 20th century, and the Phoenix Business Journal regularly voted him among its “Most Influential” business persons. Nationally, Colangelo was frequently found among The Sporting News’ list of the most powerful people in sports. Colangelo was recognized by Phoenix mayor Phil Gordon who proclaimed March 26, 2004, Jerry Colangelo Day in the city of Phoenix. The Valley of the Sun United Way also bestowed its highest honor, the Spirit of Caring award, to Colangelo on June 30, 2005, for his passion for improving lives in the community. He brought Major League Baseball to the Phoenix in 1998 and served as Chairman and CEO of the 2001 World Series champion Arizona Diamondbacks. Going from expansion team to World Series champion in just four years was a record for Major League Baseball. Arizona won the National League West in just its second season to become the fastest expansion team in baseball history to qualify for the postseason, just as the Suns did in their second season in 1969-70. Colangelo also was the key element in facilitating the move of the NHL’s Winnipeg Jets to Arizona in 1996, where they became the Phoenix Coyotes. Chairman of the NBA’s Board of Governors from 2001 through 2005, Colangelo has had influence on the growth of the NBA and was a member of the league’s Finance Committee, Long Range Planning Committee, Expansion Committee and Competition and Rules Committee. NBA Commissioner David Stern turned to Colangelo to chair a special group in the 2000-01 season that evaluated the state of the game and made rules modifications. Colangelo added to his NBA involvement with a position on the founding committee for the WNBA, helping advance professional women’s basketball in the U.S. The Phoenix Mercury were one of the WNBA’s inaugural teams in 1997 and set a league attendance record in their first season, advanced to the 1998 WNBA Finals and qualified for the playoffs three times. As with the NBA, Colangelo was involved with the governing of baseball, serving on the Legislative Committee, Equal Opportunity Committee and on the board of directors of the MLB Advanced Media, the technology arm of the league. Currently a principal partner of JDM Partners LLC, a real estate development company, Colangelo is a Board Member of World Sports Chicago and was a committee member for Chicago 2016. He is also chairman of the board of the Council of Leadership Education, and a past chairman of Collaboration for a New Century; Southwest Leadership Foundation; the National Italian American Sports Hall of Fame; Leadership Foundations of America; Arizona State University’s Dean’s Council of 100 and the Honor Board for Junior Achievement of Central Arizona; and he served as president of Valley Big Brothers and was chairman of the board of the Christian Businessmen’s Club. Colangelo has also served on the board of directors of the Phoenix Art Museum; Greater Phoenix Economic Council; Athletes in Action; and Phoenix Suns Charities. He is a lifetime member of the Phoenix Thunderbirds, an organization dedicated to the promotion of Phoenix through sports. He currently is chairman of the Naismith Memorial Basketball Hall of Fame, and is vice chairman of the National Italian American Foundation and Young Life International; past vice president of the Phoenix Downtown Partnership; past chairman and CEO of Phoenix Community Alliance; and he was a leader in the establishment of Employers Against Domestic Violence. The author of two books, Return of the Gold which profiles Colangelo’s journey and experience with the Redeem Team, and How You Play the Game, his insight into the world of the business of sports and his own life. Colangelo prepped at Bloom Township High School in Chicago Heights, Ill., where he was an all-state basketball honoree as a senior. A left-hander, Colangelo was the top pitcher on the baseball team that also featured former Yankee hurler Jim Bouton. Upon graduation he had 66 scholarship offers for college basketball and seven professional baseball contract offers. He enrolled at the University of Kansas, but transferred after his prospective teammate, Wilt Chamberlain, left the Jayhawks for a pro contract. Colangelo transferred to the University of Illinois, where he earned All-Big Ten honors, captained the Illini as a senior and was later inducted into the Illinois Basketball Hall of Fame. He also played two years of baseball at Illinois. Colangelo grew up in the “Hungry Hill” neighborhood of Chicago Heights. His ties to “The Heights” and Bloom Township are evident in the Jerry Colangelo Gymnasium, dedicated in his honor November 10, 1996, and Colangelo Way, a street named after him. Additionally, the Colangelo Center houses the Italian-American Athletic Hall of Fame in Chicago, Illinois. Colangelo and his wife, Joan, whom he met on a blind date while at the University of Illinois, have four children: Kathy Holcombe, Kristen Brubaker, Bryan, and Mandie Colangelo, and six granddaughters and four grandsons.